Stretch marks happen when you lose or gain weight quickly. The skin does not have time to gradually adjust, so tiny tears form in the superficial layer of the skin. People may develop stretch marks anytime they gain weight or grow rapidly. This can happen during growth during your teenage years, because of bodybuilding, weight gain or due to pregnancy. Once the stretch marks are there, it can be difficult to remove them. If you have recently lost weight, the stretch marks are an annoying reminder of the past that keeps hanging around. Luckily, there are some at-home treatments that you can use to help stretch marks go away. A dermaroller is known for being extremely good at alleviating the appearance of stretch marks, and it works for people of every skin tone, age and skin type. It is able to work deep within the skin to help stimulate the cells to rejuvenate. A dermaroller looks like a small roller that is covered in many, tiny spikes. It is able to help your skin heal naturally by stimulating the skin to make collagen. This helps to boost healing in your skin and heal stretch marks. There are many different dermarollers on the marketplace, so you have to find the one that is right for you. You should go for one that is high in quality to ensure that it will actually work. The shape of the device and the spacing between the needles is important for determining how effective it is and if it causes pain when you use it. You want to find a dermaroller that does not have thicker spikes because thick spikes cause slower healing and more pain. Obviously, the first step in using a dermaroller is to buy one. Afterward, you will also need some type of disinfectant and disposable gloves. Depending on your pain sensitivity, you may also want to have a numbing cream. Other optional items include a cream product, disposable paper towels and an antibacterial solution. You should make sure that your hands and the affected skin are completely sterilized. This will help you prevent an infection from happening. You should also wear gloves during the procedure for the same reason. If you do not have disposable gloves, then just makes sure that you have thoroughly washed and dried your hands. Your first step is to disinfect your hands and the target area. You can use the disinfectant of your choice for this. You can also use numbing cream to prevent any pain or discomfort. Apply the numbing cream on the targeted section of skin and let it absorb for 10 to 20 minutes. Afterward, wipe it away with a paper towel. You can also use stretch mark creams by rubbing them into the affected skin. Working in cross motions, begin rolling in a line three to five times over each spot. You can vary the number of rolls based on how sensitive you are to pain. If you have used a numbing cream, you may need to use an antibacterial product afterward to make sure that you do not unintentionally cause an infection. Leave the antibacterial solution on for about one to two hours. Afterward, you can rinse it off in cold water and apply any other cream that you need. Now that you are done, make sure to disinfect your dermaroller so that it does not develop virus or bacteria on it. Soak it in a glass of disinfectant for about 30 to 60 minutes. Afterward, make sure that it dries completely before you put it in a safe, clean location. You will not see results immediately, so be patient. Most people begin to see results within two to three weeks. Depending on your skin’s capacity for healing and other factors, it may take more or less time for your stretch marks to start to go away. The healing time can also vary based on the length of the needle, the treatment frequency, the amount of pressure you exert and the size of the dermaroller. The length of the needle is one of the main things that you should look out for. These needles come in sizes like 0.25, 0.5, 0.75, 1.0, 1.5, 2.0 and 3.0 mm. 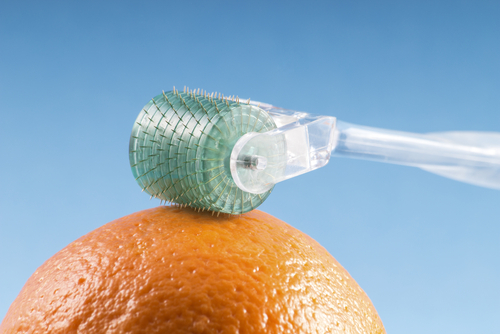 At-home dermarollers generally have needles that are in the range of 0.25 to 1.0 mm. You should not use any needles larger than 1.5 mm in size at home. The needle length can determine the amount of pain you experience and how deeply it penetrates. Smaller needle sizes are better if you are just starting out or have sensitive skin. If you have a high pain tolerance, you may be able to use a larger needle size. A needle of 0.5 mm can be used once or twice a week. A needle of 1 mm can be used every other week. Meanwhile, a needle size of 1.5 mm should only be used every three to four weeks. As long as you are following the directions on the package exactly, the dermaroller should be safe to use. It is far less likely to cause side effects than laser, surgical or chemical peel treatments. These alternative treatments can damage your skin and cause unwanted side effects. The most common side effects are pain. If you are allergic to the metal of the dermaroller, you may experience symptoms like discomfort, redness or puffiness. If you do not clean your skin, hands and the dermaroller properly, you could also experience an infection. Take care to keep all instruments clean before using them on your body. If you want to boost your healing in between dermaroller treatments, there are natural remedies that you can also use for your stretch marks. Wheat germ oil can help reduce the appearance of stretch marks. Meanwhile, rosehip seed oil is useful for boosting your skin’s regeneration, elasticity and strength. You can use gelatin to help boost your dietary collagen. All you have to do is eat it as jello or use it in a homemade broth. Vitamin E oil can be used to boost the elasticity and appearance of your skin. If you want to get rid of scars, try a blend of vitamin E oil, vanilla oil, shea butter and coconut oil. For an extra boost, try using a product like aloe vera. This natural moisturizer helps to keep your skin healthy and promotes healing in your skin. This makes aloe vera ideal to use between dermaroller treatments.